The Soyuz TMA-17M spacecraft delivered three members of Expedition 44 and 45 to the International Space Station in July 2015. A Soyuz-FG rocket with the Soyuz-TMA-17 spacecraft lifts off on July 23, 2015. 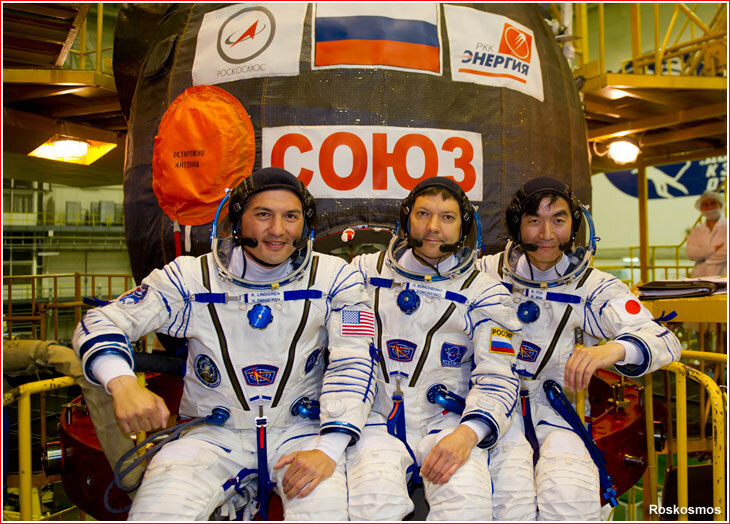 Expedition 44 crew (left to right): Kjell Lindgren, NASA; Oleg Kononenko, Roskosmos; and Kimiya Yui (JAXA) in front of Soyuz TMA-17M spacecraft in Baikonur on July 11, 2015. The launch of Soyuz TMA-17M was previously scheduled for May 26, 2015, however after the loss of Progress M-27M on April 28, 2015, the liftoff was postponed until July 24, 2015, at 23:14 Moscow Time. Following a previously unplanned orbit-correction maneuver of the ISS to avoid space junk on June 8, 2015, the launch was re-scheduled for July 23, at at 00:02:44 Moscow Time. The primary and backup crews completed their formal training for the mission at the beginning of June 2015. After fueling, Soyuz TMA-17M was returned to its processing building at Site 254 on July 13, 2015. By that time, the primary and backup crews of Soyuz TMA-17M arrived at Baikonur for a familiarization training with the flight hardware, which took place next day. 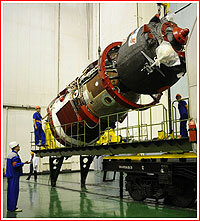 On july 14, the spacecraft was integrated with a launch vehicle adapter and a day later it was lowered into horizontal position and inserted inside of its payload fairing. On July 17, the payload section was moved from Site 254 to Site 112. The final integration of the payload section with the third stage of the Soyuz-FG rocket and then with the rest of the launch vehicle was conducted there on July 19, 2015. 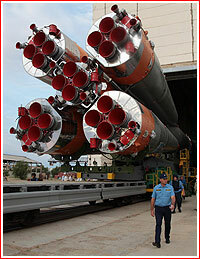 The launch vehicle with the spacecraft was rolled out to Pad No. 5 from the assembly building at Site 112 on the morning of July 20, 2015. After a day on the pad, the Interfax news agency reported unspecified technical problems discovered during final tests of the Soyuz FG rocket. As usual, TASS followed with an official denial, while admitting that some additional work with being completed during the second day on the pad, which had not been completed during the first day. In any case, the launch could proceed on a backup date on July 24, the agency said. The liftoff of the Soyuz-FG rocket from Site 1 in Baikonur Cosmodrome took place as scheduled on July 23, 2015, at 00:02:44 Moscow Time (5:02 p.m. EDT on July 22). The launch vehicle carried the Soyuz TMA-17M (No. 717) spacecraft bound to the International Space Station, ISS. 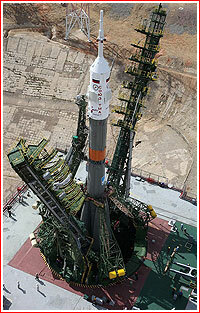 The launch was timed three minutes after the ISS flew over Baikonur in a 400.88 by 417.90-kilometer orbit. At the time of liftoff, the station was over northeastern Kazakhstan and by the time Soyuz entered orbit, the outpost flew over northeastern China. Less than nine minutes into the flight, the rocket delivered the spacecraft into a 200.5 by 240.6-kilometer initial orbit with an inclination 51,67 degrees toward the Equator. Soyuz TMA-17M was scheduled to separate from the third stage of the launch vehicle at 00:11:33.26 Moscow Time on July 23. The orbital insertion went as scheduled, however left solar panel on Soyuz did not deploy after launch. However mission control still gave the crew green light for a planned four-orbit rendezvous profile. 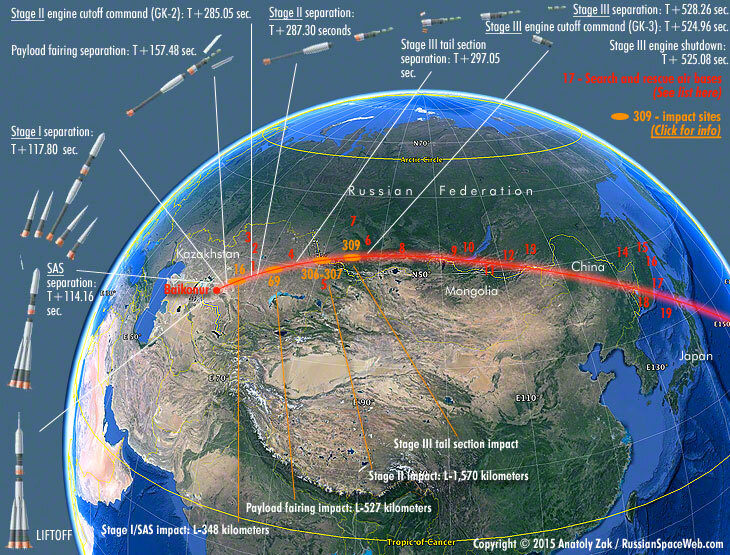 Launch timeline and ground track for Soyuz TMA-17M mission on July 23, 2015. Soyuz Commander Oleg Kononenko, Japanese astronaut Kimiya Yui and NASA astronaut Kjell Lindgren took a five-and-half-hour, four-orbit ride to the space station. Four orbital maneuvers were conducted during the rendezvous of Soyuz TMA-17M with the station: one during the first orbit and three during the second revolution around the Earth. The spacecraft made a total of four revolutions around the Earth at the time of the rendezvous with the ISS. The autonomous rendezvous with the station was scheduled to begin at 03:40:26 Moscow Time on July 23 (8:40 p.m. EDT on July 22). The final maneuvers including flyaround, a short station-keeping period and berthing was scheduled to be initiated at 05:24:58 Moscow Time on July 23 (10:24 p.m. EDT on July 22). The docking of Soyuz TMA-17M at the Rassvet mini-research module, MIM1, a part of the Russian segment on the ISS, took place around a minute ahead of schedule, on July 23, 2015, at 05:45 Moscow Time (10:45 p.m. EDT on July 22). Shortly after docking, crew members confirmed that the stuck solar panel on Soyuz had finally deployed. However, according to NASA, the solar panel actually opened around seven minutes before docking, when the transport ship was around five meters away from the station. The moment of the panel release was captured by a TV camera onboard the station, as the Soyuz was approaching its destination on the night side of the Earth. 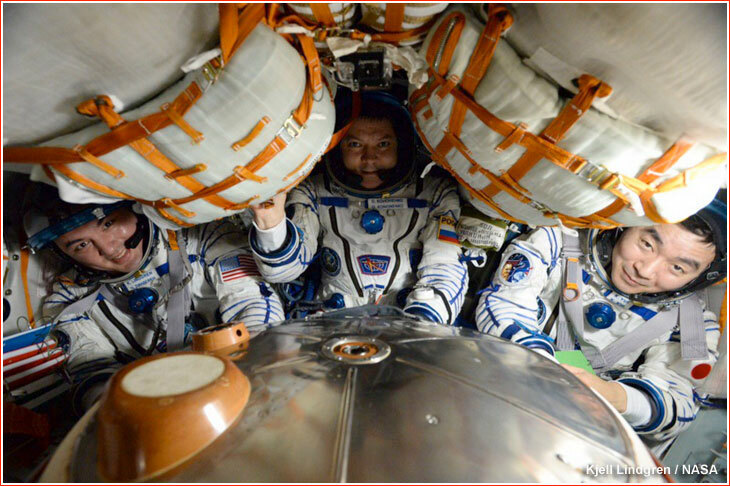 The hatches between Soyuz TMA-17M and the Rassvet MIM1 module were opened shortly before 1 a.m. EDT, 08:00 Moscow Time. The newly arrived crew is expected to stay in orbit until December 2015, logging 163 days in space. 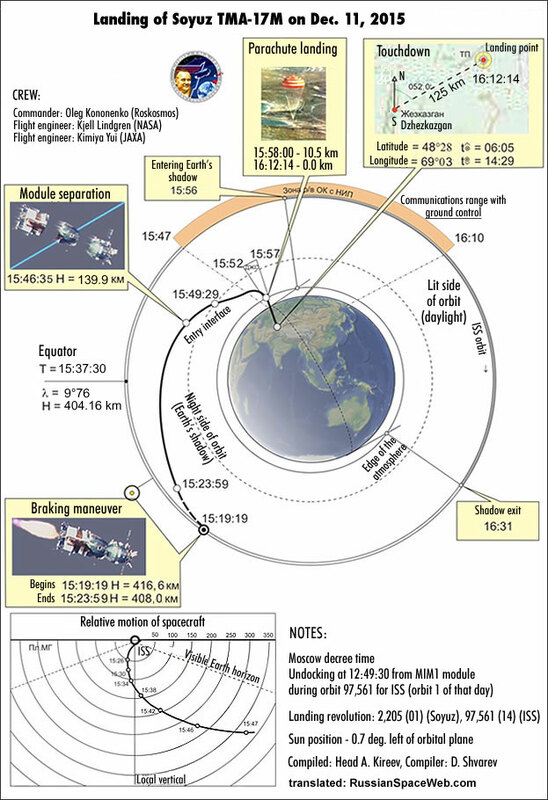 ISS configuration at the time of Soyuz TMA-17M's departure. After 141 days aboard the International Space Station, ISS, the crew of the Soyuz TMA-17M spacecraft was to conclude the 45th expedition on the outpost. 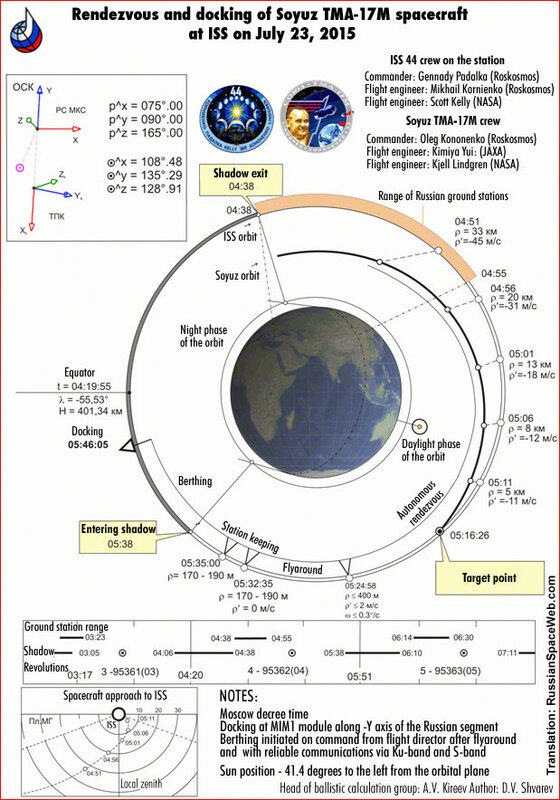 According to the Russian space agency, during their the final week in orbit, Oleg Kononenko, Kimiya Yui and Kjell Lindgren conducted two landing simulations to refresh their knowledge of necessary procedures. By December 8, in preparation for landing, aircraft and other assets of the Central Military District were deployed at airfields in Kazakhstan, Interfax reported. A total of 180 members of the military personnel, 12 Mi-8 helicopters, four An-12 and An-26 aircraft and 18 ground vehicles were to be involved into search and rescue operation. On December 9, Deputy Chief of Gagarin Training Center Maksim Kharlamov announced that the crew had been fully ready for landing. The return to Earth operations began with the hatch closure between Soyuz TMA-17M and the ISS at 09:32 Moscow Time (1:32 a.m. EST) on December 11. 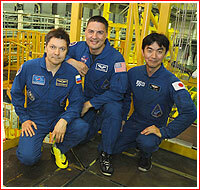 Kjell Lindgren, Oleg Kononenko and Kimiya Yui onboard Soyuz shortly before departure from ISS. 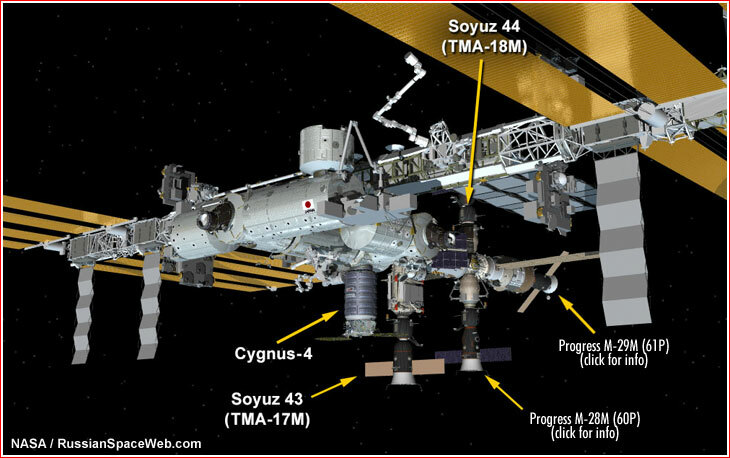 The undocking of the Soyuz TMA-17M spacecraft from the MIM1 module, on the Russian segment of the ISS took place at 12:49:44 Moscow Time (4:49 a.m. EST), as the station was flying over Russia near Chinese border. Minutes later, the spacecraft conducted an eight-second separation maneuver with four of its attitude control thrusters to increase its distance from the ISS to 12 kilometers for a braking maneuver some three hours later. According to NASA, a weather forecast at the landing site expected overcast skies, breezy, light snow and temperature of about 27F. However by the time of the deorbiting maneuver, the weather had worsened at the landing site, bringing more heavy clouds and lowering cloud ceiling to 700 feet. The deteriorating weather prompted mission officials to expedite all recovery operations. Only four most essential helicopters out of 10 available were sent to the landing site to extract the crew as soon as possible and transport its members to a nearby airfield in Dzhezkazgan instead of Karaganda, NASA said. The four-minute 40-second braking engine firing began at 15:19:18 Moscow Time (7:19 a.m. EST) at an altitude of 416.7 kilometers above the Earth's surface. The maneuver slowed down the spacecraft by 128 meters per second pushing it off its orbit. Around 23 minutes after the completion of the braking maneuver, the descent module, SA, with three crew members inside, separated from the habitation module, BO, and the instrument module, PAO. Following the controlled aerodynamic reentry into the atmosphere, the descent module released its three-tier parachute system at 15:57:58 Moscow Time (7:57 a.m. EST) at an altitude of 10.5 kilometers. The touchdown site was expected to be around 125 kilometers northeast of the town of Dzhezkazgan, after sunset. According to NASA, it was the sixth night landing for Soyuz in the ISS history and the first post-sunset landing, since five previous ones had taken place in pre-dawn hours. 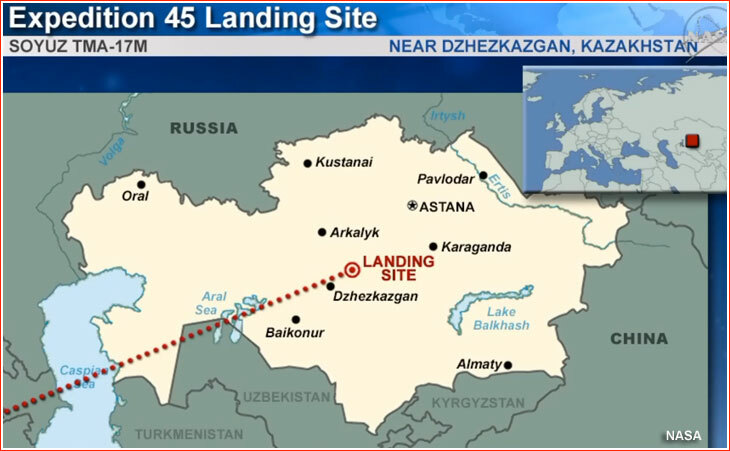 The scheduled landing time was 16:12 Moscow Time (8:12 a.m. EST, 7:12 p.m. Kazakhstan time), however the factual moment of touchdown could not be immediately confirmed due to darkness and bad weather at the landing site. The Russian mission control confirmed successful landing around six minutes after the scheduled touchdown time. 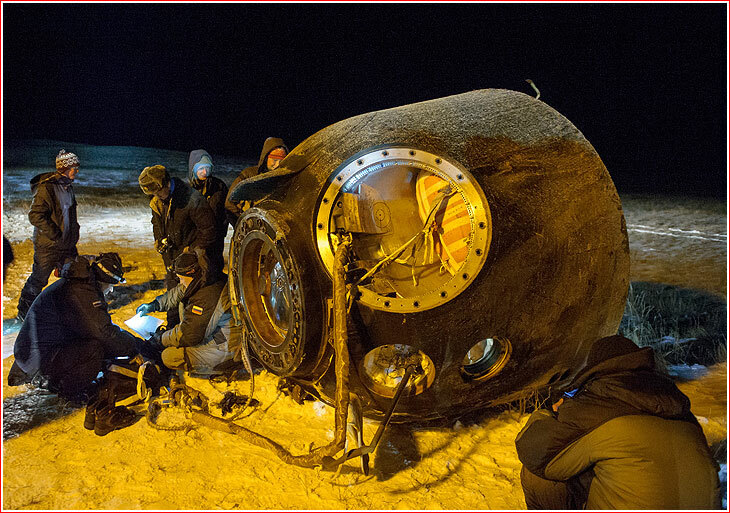 Recovery teams reportedly saw strobe light of the descent module still in the air under the parachute and then found the capsule resting on its side in the snow-covered ground. 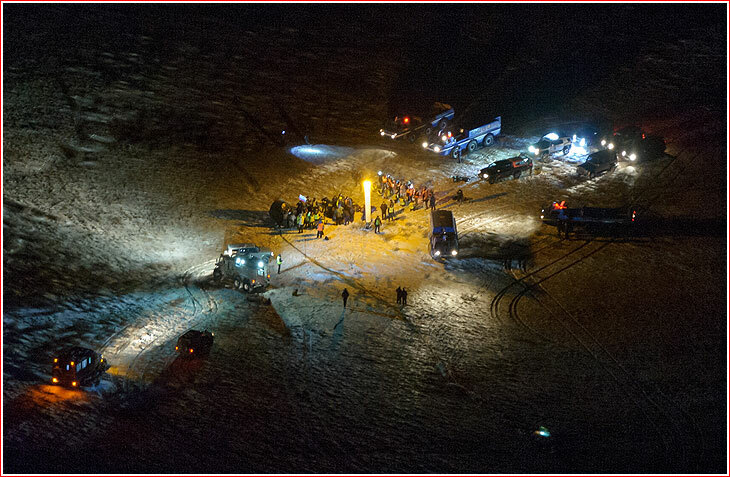 Despite darkness and cold weather, the crew was successfully extracted from the descent module within 30 minutes after landing. 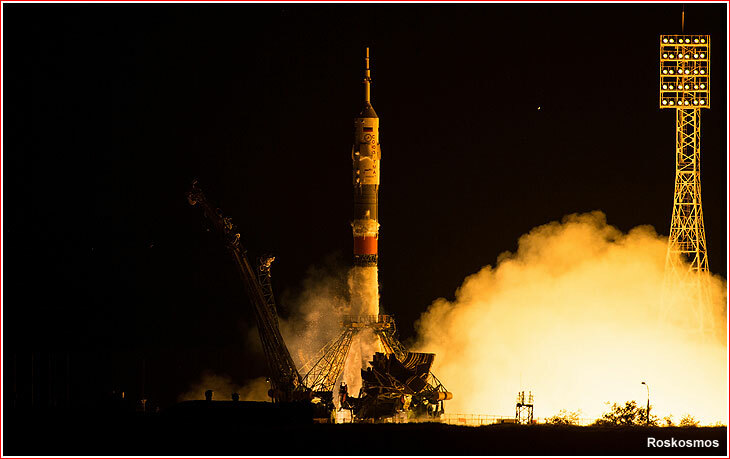 Back in orbit, the departure of Soyuz TMA-17M officially marked the beginning of Expedition 46 aboard the station under the continued command of NASA astronaut Scott Kelly, who is on a nearly year-long mission. Along with his crewmates Mikhail Kornienko, (also spending a year in space) and Sergey Volkov of Roskosmos, the three-person crew will operate the station for four days until the arrival of three new crew members. NASA astronaut Tim Kopra, Russian cosmonaut Yuri Malenchenko and British astronaut Tim Peake, representing the European Space Agency, are scheduled to launch from Baikonur, on Dec. 15, 2015, onboard the Soyuz TMA-19 spacecraft.